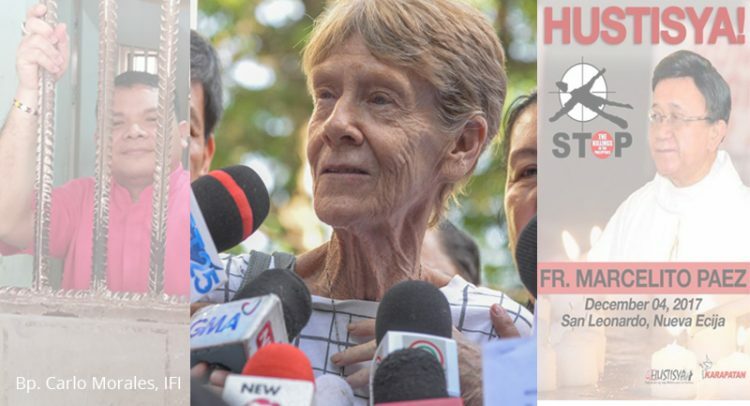 While rejoicing over her release, the National Council of Churches in the Philippines is vehement in denouncing the arrest and detention of Sr. Patricia “Pat” Fox, NDS, a missionary of the international Roman Catholic congregation of the Sisters of Our Lady of Sion. Sr. Pat was picked up by six intelligence officers of the Bureau of Immigration at 2:30 PM of April 16 supposedly just to verify her papers. She was detained overnight and was released in the afternoon of the next day. Sr. Pat still faces possible deportation for her alleged “political activities”. The President later said that he ordered the Bureau of Immigration to investigate her for “disorderly conduct”. The 71-year old Australian nun is known within ecumenical circles for her community, missionary and social justice work in the Philippines. She is an indefatigable advocate of the rights of peasants, indigenous peoples, and the urban poor. Sr. Pat has been doing missionary work in the Philippines for nearly three decades, journeying with the marginalized and oppressed Filipinos to whom she has showed deep compassion and love. So it is disheartening that she would be harassed thus. The detention of Sister Patricia Fox speaks loud and clear of the powers that be, of their aim to suppress the truth and cast out those who dare tell it. With the increasing number of human rights violations, her detention is an indirect admission of guilt by this government, which threatens and persecutes human rights advocates who witness the suffering of and show solidarity with the vulnerable. We call upon our member churches, Regional Ecumenical Formations, and the international ecumenical community to call for the dropping of charges against Sr. Pat and denounce the apparent persecution and harassment of human rights advocates. We pray that Sr. Pat will persevere in her work for God in standing up for the exploited and oppressed and supporting the widows, the orphans, and the poor. REV. REX R B. REYES, JR.